1- 13 Palestinians have been shot, including five children, and 170 wounded including 40 children, the majority originally from the provinces of Jerusalem and Hebron; 380 civilians have been arrested, including dozens of children. 2- Announcement of the construction of two new settlements and 1,000 new housing units in various settlements in West Bank and Jerusalem. 3- Announcement of the construction of a shopping mall and hotel in Jabal Al-Mukaber, south east of the old city of Jerusalem and of the allocation of one million shekels to dig a new tunnel in Silwan. 5- Burning 250 olive trees in Jubarah, Tulkarem; dozens of olive trees in Burein-Nablus and 10 dunums planted with fruit trees have been torn down by bulldozers in Wadi Fukeen, Bethlehem. The clashes with Israeli Occupation Forces concentrated in the Hebron area, in 'Arroub and AlFawwar refugee camps and by the junctions of Beit Ummar, Halhul and Seir. Clashes continue as well in Jerusalem, Isawiya, Shuafat refugee camp and in the villages of Kufr Qadoum, Ni'lin, Bil'in and in Jalazoun refugee camp. The colonization of WB and Jerusalem intensified in September, with the announcement of the construction of two new settlements. The first one will be built in the south of Nablus: to start with, 100 housing units will be built on lands confiscated from the towns of Qaryout and Jaloud, next to Shilo settlement. This settlement is to go forward with the division of the north to the central West Bank. The settlement lengthens the so called Ariel finger: the line extending from Kafr Kassem, south of Qalqilya, to the Green Line aimed to cut connection of the Northern districts of the West Bank with Jordan Valley. It passes through the territory of three governorates, Qalqiliya, Salfit and Nablus. Already in 2014, the Israeli occupation government has turned 2 outposts into settlements in order to reinforce Ariel settlements block. The second new settlement will be built on "the slopes of the flame", the southern-western slopes of Jerusalem’s hills, in front of the village of Walaja and close to the town of Beit Jala. The new settlement will be constructed on an area of approximately 170 dunums of Palestinian land. The plan is to build 493 housing units, a synagogue and various facilities. This settlement will reinforce the line to separate Jerusalem from the south of the West Bank. It is part of the Greater Jerusalem 2020 project to build 56,000 housing units in Jerusalem, specifically in the Har Gilo/Har Homa - complex that develops throughout the southern part of Jerusalem, across the west area of Bethlehem’s settlements block down to the Gush Etzion block. Last month, the occupation authorities launched a call for tenders for the construction of 514 housing units in Jerusalem and West Bank settlements, mostly in the settlements of Alkna, Beit Arieh and Givat Ze'ev, near Ramallah. Moreover, 138 dunums have been confiscated in Salfeet for the establishment of new infrastructure and for the expansion of Burqan Industrial zone. In Jerusalem, the "the Department of Lands" launched a call for tenders to build a seven-stores hotel of 150-rooms, on top of Jabal Al Mukaber, in order to encourage and support settlements in occupied Jerusalem. As part of the occupation scheme, the project aims to reach about 1330 hotel’s rooms in East Jerusalem. In Jabal Al Mukaber, Jerusalem municipality is confiscating land to build a new synagogue and a swimming pool for the settlers of Nof Zion. Demolitions go on as practices of forceful displacement and collective punishment. Throughout September, the occupation authorities demolished 17 houses and 44 among business shops, agricultural structures and infrastructure, for a total of 61 structures demolished. The areas of Jabal Al Mukaber, Sur Baher, Issawiya, Abu Tor, Mount of olives, Beit Safafa, the old city of Jerusalem and Beit Ola and al Jourah in the city of Hebron were all targeted. Moreover, demolitions took place in Al aqaba Kherbet al Hamma, Jordan Valley; in Hawara, Beit Dajan, Nablus and in Bil'in, Ramallah. Meanwhile, Israeli occupation authorities issued dozens of demolition orders in the town of Issawiya, Jerusalem. Last week in Khirbet Al-Hamma, northern part of the Jordan valley, 18 tents and animal shelters have been demolished. According to the forceful displacement ratio, Israeli occupation forces are currently preventing Mahmoud Awad to rebuild tents for him and his family trying to force him to leave the place. Later last month, Israeli bulldozers demolished the school of the Bedouin community of Abu Nawar, East Jerusalem, for lack of building permit. The representative of Abu Nawar, Daoud Jahalin, reported that the civil administration bulldozers and IOF troops stormed the community location at five o'clock in the morning and demolished one third of the elementary school attended by 45 children. He pointed out this is the second time the school faces a demolition, as it came just after the community had rebuilt the school due to the complete demolition of the school earlier this year in February. He stressed how the occupation forces have issued more than 250 demolitions orders the houses of community, as part of bigger plan to ethnically cleanse E1 area from 23 Bedouin communities and it is through continuous demolitions that they to destroy the entire community. He continued: IOF plans to deport 113 families consisting, a total of 600 people, to steal their land for the expansion of settlements. As the olive harvest approaches, the IDF targets cultivated lands to undermine the communities’ capacity of sustenance. 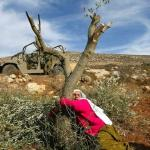 In Arab Annajadah’s community, in Masafer Yatta south of Hebron, the occupation bulldozers destroyed 200 dunums planted with olive trees to force the community to leave the area. In Khirbet Jabara south of Tulkarm, the occupation forces set fire to about 250 olive trees along the Apartheid Wall by throwing light bombs in the region. The settlers of Yetzhar, burnt dozens of olive trees in Burin, south of Nablus. Israeli military bulldozers also uprooted dozens of fruit trees in Wadi Fukin, west of Bethlehem and the Israeli bulldozers razed lands off to build a military tower at the entrance of Beit Ummar village, north of Hebron. The fourth Geneva convention settles the rules the occupying force has to comply to when occupying the land of another People. These rules have been set in order to protect the civilian population. Among the rest, the Geneva convention forbids: transfer of the occupying force own population in the occupied territories and mass forcible transfer of the local population in order to alter the demographic composition of the land; collective punishments; use of unjustified violence on the occupied population; attacks on the resources of the occupied population. The Geneva convention also imposes that the occupying force does as much as possible for the local population to conduct a normal life. Israel is violating all these provisions and the silence of the International Community, makes them complicit.